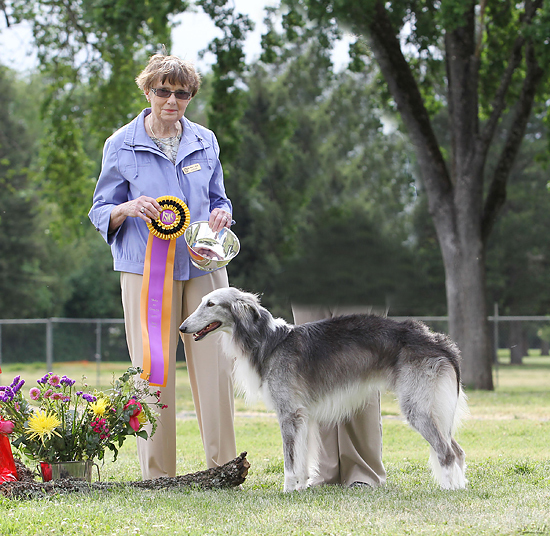 Scirocco Hounds is a small kennel exclusively devoted to Silken Windhounds, the fascinating new breed of long haired sighthounds developed by Francie Stull of Kristull Kennel. Silken Windhounds are lovely and loving, a wonderful mix of all that's best in the sighthound psyche; playful, intelligent, companionable, inquisitive, amusing, AND beautiful. Temperamentally Silken Windhounds are friendly and love to be with their favorite people. They seldom display the aloof attitudes common in other sighthounds and adore socializing with humans and other dogs, particularly their own breed. Athletes all, Silken Windhounds love to run, leap and play but can also be happy to just hanging out with their humans. They've been adapted to all sorts of activities including racing, agility, therapy, and obedience and of course the show ring. Ours seem happiest on the coursing field but they're quite capable of turning even the smallest back yard into a race track or agility course. Silken Windhounds develop their coats slowly as they grow into adulthood. Young Windhounds are often mistaken for whippets, adults more closely resemble borzoi but in fact they are neither in size or attitude. They combine the lovely tresses of the borzoi with the more portable whippet size. Their coats can be either long and flowing or thick and curly; both types are acceptable and attractive but often aren't fully developed until the Silken Windhound reaches two or three years of age. Our goal at Scirocco is to breed for quality with the best interests of breed development in mind. We hope to breed Silken Windhounds that excel in coursing while still maintaining their easy-going family friendly temperament. Hounds of Scirocco - Our New Website!